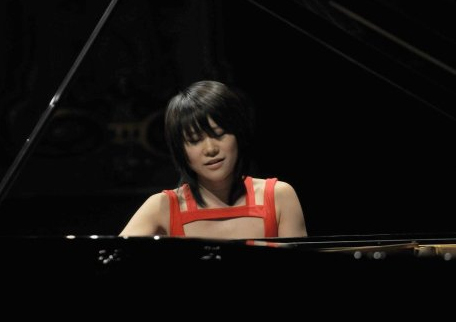 These days, there are a lot of pianists Yuja Wang’s age or even younger that have mastered the nearly-inhuman technical virtuosity required of pieces such as Liszt’s Sonata in B minor, which the 24-year-old performed to a rapt audience of nearly 600 as part of the Ladies’ Morning Musical Club season in her Montreal recital debut. Take Lang Lang, for example, a more direct parallel than most others as both are prodigies that emerged from China at around the same time, and both studied with Gary Graffman. But what Wang seems to have that Lang Lang and countless other young shooting stars don’t is a natural restraint, an unassuming air and ease with the keyboard that one doesn’t usually get from the showy former child prodigies—at least not at this stage of their careers. She opened the concert with Scriabin preludes and etudes, her voicings crisp, her accompaniment figures not too over-pedaled. She played the short pieces as a suite, with barely a pause between each song. Prokofiev’s Sonata No. 6 in A major closed off the first half, a difficult piece which she was comfortable enough with to appear as if she were almost playfully improvising the percussive lines. There was drama here, but not to excess. Wang took full command with the already-mentioned Liszt Sonata in B minor in the second half. It’s a dazzlingly difficult masterpiece, but with long stretches without cadenzas it’s not as overtly crowd-rousing as some other Liszt solo piano pieces. That Wang managed to pull off and hold the attention of the audience during the pensive sections as well as the showy ones is clear proof that Wang is a player with an abundance of early-onset maturity. Her control and reserve seems to be a lucky extension of her personality: although she’s known for glamour outfits and audiences undoubtedly love her, the way she bows and interacts with the audience betrays shyness instead of groomed charisma. And when that translates to playing, it becomes magic: she lets the music speak for itself. The best part of watching her in recital is that you actually forget that she is a beautiful young star, which is hard to do. To borrow some analogies from the movie world: she’s a method actor with the face of an ingénue and the appeal of a lead. A career to watch.